Mean-spirited and . . . just plain mean! I’ll admit that I’m generally pretty slow on the uptake in recognizing if a particular newspaper, book or film has an “agenda” unless it’s fairly blatant. 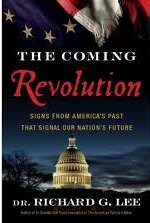 There is no problem at all in puzzling out the agenda in The Coming Revolution by Dr. Richard G. Lee. This book makes no bones about hitting the reader over the head with the author’s agenda, which is radical conservatism. He attempts to present himself as a learned historian who is using the lessons of the past in an attempt to forecast the future of the United States. However, by page 13, when he’s bemoaning the current state of political discourse in the US as “bickering and name-calling,” he’s already spoken disparagingly of “feminists, ” “left-wing groups” and “socialistic-minded elites” (surely an oxymoron, if Dr. Lee could be bothered to look up the definition of the word “socialist”). He also states, “I am convinced that every one of the problems confronting this nation today can be solved by concerned citizen action,” yet anything that doesn’t involve the tea-party movement (the only ones allowed to have a voice, apparently), is “an unrepresented segment of the electorate” bent on radicalism, violence and civil disobedience. So which is it? Are citizens allowed to voice dissent with the status quo, or does that make them feminist-socialist-elites? It’s all very confusing. While I’d hoped for a book taking a realistic view of the problems confronting the US, I really have no use for this mean-spirited, narrow-minded cheerleader for the radical right. We get enough of that on the radio and TV, I certainly don’t need it added to my reading material.